GlacialTech Inc. was established in June 2001 by a team of 8 world-class researchers (PHDs) and three factory owners. Its technological areas of expertise include specialized thermal theory, soldering and mounting technologies, mechanism design, test and verification environment build-up and advanced conduct material development. As a total thermal solution provider, GlacialTech is committed to using lighter weight materials, lower noise and lower manufacturing cost to deliver superior cooling solutions. All this has brought about the increased value for our customers with lighter system board loading, quiet working environment and optimal price performance. Price performance, noise performance and weight performance are our three cooling design philosophy. Having acquired ISO 9001 and 14001, GlacialTech commits itself to using green materials for its products designs and to perfecting green manufacturing processes in manufacturing its products. 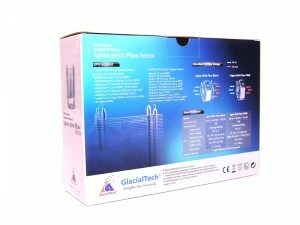 The Glacialtech 5610 Plus series are packaged in the same box with a sticker differentiating between the Silent and PWM versions. The front entails a large image of the silent model with its dual fans surrounded by blue and white swirls – presumably representing the cool air being emitted. To the right a smaller image of the 5610 PWM is displayed above the illuminated Igloo 5610 Plus Series. 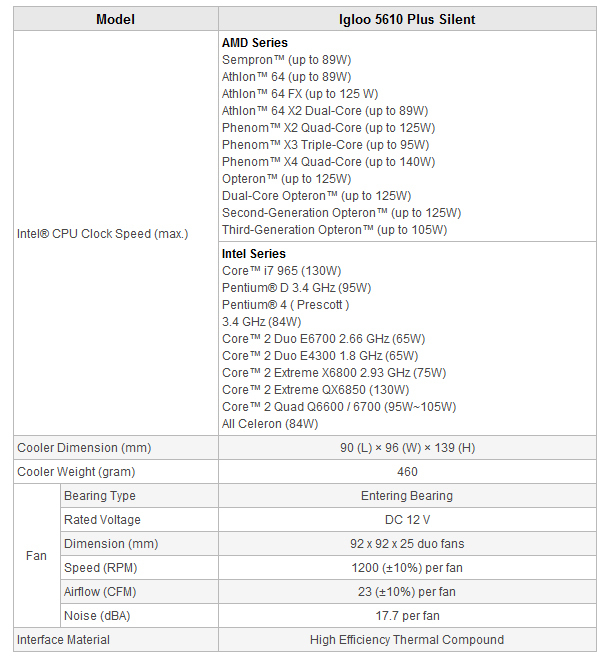 The back is also blue and displays the full list of CPU support – Intel and AMD. Of course we get all the facts and figures in the form of a table and finally a couple of images represent the airflow patterns which are pretty obvious – the hot air sucked in through the intake fan and then blown out of the exhaust fan. Overall, the packaging is good though – very clear and crisp. The manual is more of a fold out sheet but it does the job and the pictures, albeit in black and white, are clear and easy to follow. There are lots of different clips for all the different sockets with the 5610 series being compatible with a wide range of sockets including the newest LGA1366. Finally, 4 wire clips are included to attach the two fans to the heatsink. Tower format coolers have really dominated the market in recent times and the latest competition between the thermal solutions manufacturers seems to be how many heatpipes can you fit in the heatsink? In answer to that Glacialtech have decided to take a different approach and only use two. Thus, the heatsink is much slimmer and so much easier for use in smaller chassis. The heatpipes are shaped into the usual ‘U’ shape bending up through the fin stack in order to evenly distribute the heat from maximum heat dissipation. As with all CPU coolers, the ends are nicely capped off for a more professional look however Glacialtech have gone for the silver look instead of leaving the natural copper finish on the pipes. The top has an imprinted Glacialtech logo which is another nice little touch – the logo is again imprinted onto the bottom fin. The fin stack is comprised of very thin aluminium fins with larger spacings so as to allow the air to easily flow through the heatsink. The benefit of wider spacings are also that then fans do not need to have such a high static pressure as it is less difficult for them to push the air through. Moving onto the base, which is protected by a large plastic cover in the box, we can a thin layer of thermal grease has been pre-applied. On the plus side, this means that the user does not need to spread the paste themselves and this also ensures that the paste is evenly spread so as to create a good contact with the top of the CPU. Unfortunately, no extra thermal paste was included and so if the cooler, for any reason, needs to be re-applied separate thermal compound will need to be purchased. 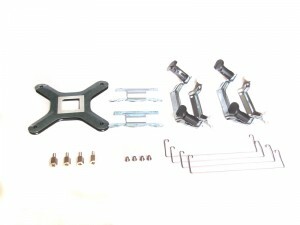 Finally we come to the dual fans; the cabling for both the fans has been attached together so that only one connector is needed – this is very useful if you have limited fan connections on your motherboard. The fans themselves are both 92mm designs which produce airflow of 23 CFM @ 17.7 dBA. I think that the choice to use 92mm fans instead of the smaller 80mm counterparts if definitely a good move as I would have though dual 80mm fans would be pretty noisy especially with their reputation of being a little whiney. The first part of the installation as with many CPU coolers is placed the backplate behind the motherboard – Glacialtech have a sticker on the backplate to help hold it in place. Then, the correct clips for the LGA775 socket need to be screwed onto the base of the 5610 Silent cooler. For the socket 775, the screws in the mounting clips just screw into the backplate secured the heatsink. Then we come to the fans which are both attached using wire clips. Unfortunately, they are not the easiest to use and are pretty fiddly to use. I would much prefer if the clips were bent more so that it’s easier to push them on once the ends are through the holes in the fan. As it is they are quite straight and it’s pretty difficult to get the fans on. That said, once on, the fans are very secure and all that remains is to plug in the connector to the motherboard. N.B. Make sure both the fans are facing the same way or else they will be blowing air back onto each other and not taking the hot air out of the heatsink! At Verdis Reviews, we test socket LGA 775 CPU coolers by booting the PC up into Windows XP and then taking temperatures in both idle and load states. The temperatures are taking using Core Temp and averaging the four core temperatures. For idle testing, we simply leave the PC for 30 minutes and then come back and take the temperature readings. For load, we run prime95 for 20 minutes before taking temperature readings once more. Finally, noise is that final factor that is tested; however, at Verdis Reviews, we are not yet at the stage where we can use high tech sound equipment and therefore, noise testing is left to the human ear – not the most scientific but it gives a good impression of how noisy the cooler is. Ambient temperature was 18 degrees and a number of coolers will be used for comparison purposes. 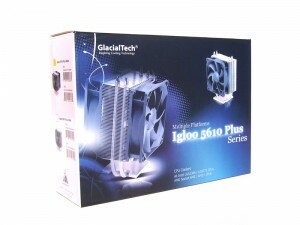 Clearly the Glacialtech 5610 Plus cooler is not the best by any means but it does offer some very solid temperatures. It easily beats the stock Intel cooler and isn’t too far behind the Zalman VF2000 which is an impressive top-down cooler. We weren’t expecting anything absolutely amazing here especially when compared to the high end Noctua NH-U12P cooler but it has shown that the cooler is able to offer very solid performance that is very good for a cheaper cooler. The dual 92mm fans were surprisingly very quiet and although they are not exactly silent as the name suggests they are not too far off and not really heard above the fans in my test rig. Indeed they were much quieter than I was expecting. Now this is the great part about this cooler – it only sets you back about $15. Now that really is value for money. This cooler is not for the high end gamer who needs extremely low temperatures or the enthusiast who wants ultra silent cooling; it’s for the average user – someone who needs some solid performance but doesn’t want to break the bank. Of course we didn’t expect this cooler to compete with the high end products but the 5610 Plus Silent excels at being a very affordable, well-performing cooler that is able to offer significant improvements over the really bottom end products such as the Stock Intel cooler. The only downside are the metal fan clips which are really not easy to use but I’m sure Glacialtech will be able to improve them by bending them more so it’s easier to push them on. I would really recommend the 5610 Plus to any user looking for a good cooler that is definitely value for money – well done Glacialtech! 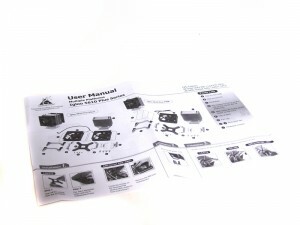 Thanks go to GlacialTech for providing the cooler for review.